The Faculty Factor: Reassessing the American Academy in a Turbulent Era. Martin J. Finkelstein, Valerie Martin Conley, Jack H. Schuster. Baltimore: John Hopkins University Press, 2016. Since World War II, American universities have been perceived as the global leader in higher education with federal government support and the rise of faculty influence in university governance. But since the turn of this century, escalating costs, demands for efficiencies, and administrative growth have changed the American university where its workforce is characterized by the rise of contingent faculty and the decline of full-time ones. 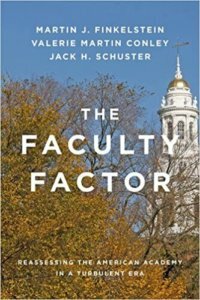 The Faculty Factor examines the status and prospects of faculty in this new era and what it means to be a professor today in American higher education. For those in academia – and for those who are thinking about entering it – this is requiring reading. Part One consists of three chapters with each one having a different objective. Chapter One provides the premises of the book that a new era exists for assessing the faculty condition in higher education. Chapter Two reviews how American higher education has evolved since its inception. Chapter Three presents data about the key characteristics of the American faculty over time and highlights particular recent salient changes. The two basic premises of the book are to acknowledge that, in spite of contradicting realities in higher education, generalizations about it are possible and that faculty continue to play a central role in American universities (5-6). These premises are established in a context of technological change, globalization, and a climax of harsh financial restraints for American higher education (7). This context is part of the “third paradigm” of higher education, an era where faculty now must wrestle with technology, marketplace forces, global considerations, specialization, nontraditional appointment, diminishing power in university governance, changes in accountability and assessment, decreasing loyalty to one’s institution, and a diversification of the faculty itself (e.g., gender, ethnicity, age) (12-18; also 53-96). These new academic realities constitute a paradigm shift in higher education in the twentieth-first century. For instance, nearly half of institutions and student enrollment have migrated to the two-year public and two- and four-year for-profit sector but faculty have not followed, with the staffing at these institutions being mostly part-time (94-95). Faculty itself are aging with tenured faculty staying on past the age of seventy in significant numbers, while younger faculty are more diverse in terms of gender, ethnicity, and national origin. “Core faculty” at universities will continue to age and diminish in numbers while “independent contractors” will continue to rise (96). Part Two reassess the trajectories of academic careers. Chapter Four examines the changing circumstances of entering an academic career, including paths no longer directly from graduate schools. Chapter Five advances the thesis that the deteriorating conditions for the academic profession will undermine the attractiveness of this career, with data from the National Science Foundation as evidence. Chapter Six explores various exist strategies from academia. Looking at people who entered the academic market in 2003, The Faculty Factor shows that PhD representation was highest in the humanities and social sciences and lowest in the applied professions (e.g., health science, business) and those with PhDs tended to be employed at four-year institutions while those without were at two-year schools (103-5). Approximately half entered academia; one-fifth to business and industry; and less than a tenth in government or the nonprofit sector (108). However, in the past twenty years, a majority of PhD recipients have entered into nonfaculty positions for employment (e.g., postdocs), as tenure-track positions continue to decline (137-38; 174-81, 198-99, 206-16), and a majority of new entrants into the job market today do not have a PhD (149-50). The traditional path of graduate school to a tenure-track position is increasingly becoming a minority route for those entering the academic job market. Part Three consists of three chapters that explore the life of a faculty member. Chapter Seven examines the pressures facing faculty today: technology with its outsourcing of instructional purposes, the diminishing need for staff, and the benefits to research; the change in faculty governance of the university, and trends in collective bargaining. Chapter Eight looks at the academic culture of faculty with the decline of liberal arts majors, the changes in tenure, the prospects of academic freedom, and issues of work-life balance. Chapter Nine updates basic compensation data about faculty and those who have advanced degrees but are employed outside of academia. Part Four explores the impact of globalization on American higher education. Chapter Ten highlights the trends of importing to academic talent, and exporting from, the United States, with STEM (science, technology, engineering, and mathematics) playing the biggest role. The chapter also explores the increasing cross-national scholarly collaboration in teaching and research. Chapter Eleven compares American faculty compensation and appointments to other countries. Globalization has become integrated into the system of American higher education. For instance, approximately one-tenth of American faculty teach aboard, with natural scientists the least likely to go overseas (378); half of American institutions reported they have integrated international content into their courses (381); and two-fifths of American faculty have said that international perspectives had penetrated their research (388). The most powerful factor that leads to faculty internationalization is faculty knowledge (professional values, orientation, and self-conception) rather than institutional efforts or sociodemographic factors (388-95). Although the American system of higher education is different than other countries (faculty are members of corporate entities rather than civil servants, the role of market forces in shaping American universities, the variety of institutional types, and the academic career structure in terms of timing and sequence) (407-9), The Faculty Factor is able successfully compare American faculty to its international counterparts. Some findings are that American faculty members are less likely to be at research universities (410-13), are in the middle in the distribution of appointment of full-time faculty members (413-14), are the highest to spent time devoted to teaching (414-47), are more likely to work individually on research (417-18), and play less a role in evaluating faculty work, which is usually reserved to chairs and deans (423-48). American faculty salaries are at the top second only to Canada, Saudi Arabia, and a few other countries (437-40) and express high career satisfaction (75.1% compared to the global average of 60%) (440-43). The concluding two chapters sum up the earlier chapters and speculate about the future. Chapter Twelve revisits the book’s theme of the “new paradigm” of American higher education: the change and redistribution of academic appointments with a decline in full-time, tenure faculty members (451-54), the accelerated specialization among faculty in both content and role (454-60), the diminishing influence of faculty on university governance (460-61), and the scramble for a global competitive advantage among American universities (465-67). Chapter thirteen looks at some of the looming challenges and issues that will confront American higher education: decline in Pell Grant funding (471-72), the norm of part-time faculty (473-76) and the disappearance of tenure (476-79), the evaluation of faculty (479-81), and the effectiveness – or ineffectiveness – of accreditation (481-82). The Faculty Factor concludes with some recommendations, such as making data more transparent to students, parents, and the higher education community (474) and creating an advisory panel at the American Association of Universities to define academic appointments and the criteria of how many full-time faculty members should be employed at doctorate, masters, and baccalaureate institutions (474-76). Another recommendation is the implement of post-tenure review as a means to protect tenure from market and ideological forces that seek to abolish tenure outright (477-81). A final recommendation is that accreditation agencies need to account for the number of full-time faculty at universities and what influence they have there (481-81). The Faculty Factor paints a picture with an array of statistical data that American higher education has entered a new era of market forces, diminishing resources, and administrative governance. Faculty need to adapt and adjust to these circumstances if they wish to remain relevant to university life. Failure to do so is to suffer the fates of the humanities where student enrollment, faculty appointment, and public support have vanished. But before devising strategies to have faculty be influential again in their profession, they need to know what their work conditions are first. The Faculty Factory shows this and possible ways for faculty to regain their position of prominence in American higher education. Lee Trepanier, Why the Humanities Matter Today? In Defense of Liberal Education (Lanham, MD: Lexington Books, 2017).